This August, Party of 5 will have the opportunity to stay at the Hyatt Regency Philadelphia at Penn's Landing during out trip to The Please Touch Museum. Hyatt recently announced a groundbreaking children's menu. "For Kids, By Kids" offers healthier menu options plus fun, fresh and flavorful items. “For Kids By Kids,” which provides more nutritious, fresh and interactive offerings for the three million children served annually in all full-service Hyatt hotels and resorts throughout the U.S., Canada and the Caribbean. The menu is grounded in Hyatt’s industry-leading philosophy Food. Thoughtfully Sourced. Carefully Served. – promoting healthy people, a healthy planet and healthy communities – and has been developed in association with the Partnership for a Healthier America (PHA). As part of the roll out, separate from its PHA commitment, Hyatt hotels will offer a three-course organic meal for children developed exclusively for the brand by renowned food pioneer and chef, Alice Waters. While Party of 5 does indulge in fast food, I will be the first to admit that my kids usually eat the fruit over the fries, which pleases me. 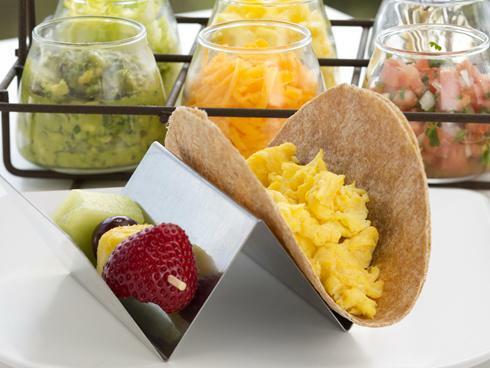 “For Kids By Kids” further illustrates Hyatt’s commitment to Partnership for a Healthier America, which will hold Hyatt accountable for continuously improving the nutritional profile of food menus at fullservice Hyatt properties across the U.S. over the next ten years. Through this commitment, Hyatt’s “For Kids By Kids” will offer fruits or vegetables as the default side item, make low-fat milk available with free refills, meet the most recent U.S. Dietary Guidelines for Americans, MyPlate and PHA’s standards and ensure food illustrations depict healthier options. fun toppings; Waffle Dipping Sticks with peanut butter, maple syrup and fruit sauces. whole wheat mini-sub. (These offerings are also available during dinner hours). To add another layer of fun to mealtime, Hyatt will launch HyattFlavorJourney in September where kids and parents can learn more about “For Kids By Kids” and enjoy games and activities. Guests can use a QR code on their menu to link to the site. I am super excited for our upcoming trip and can't wait for my kids to try out the NEW for Kids, By Kids Menu! !